Strong inner and outer thigh muscles enhance athleticsim. Your abductors or outer thigh muscles move your leg away from your body's center. Once your legs reach their destination, they rely on your adductors or inner thighs to bring them home. These muscles are not always the stars of the show. While your hamstrings, quads and glutes do their thing, your abductors and adductors play a supporting role by assuring knee stability. Strong abductors and adductors cause others to envy your athletic prowess, along with your shapely set of legs. Your inner and outer thighs perform both isotonic and isometric contractions. Isotonic exercises always involve movement. 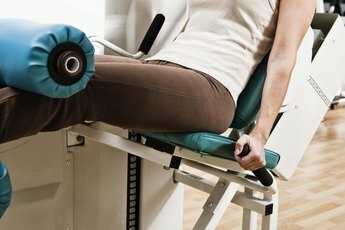 The abductor/adductor machine -- sometimes called the good girl/bad girl machine -- is the iconic abductor/adductor exercise. Skating, hockey or any sport that uses lateral movement requires isotonic abductor/adductor strength. In contrast, isometric exercises, also called static strength training, involve muscular actions that occur without movement. When skiing, snowboarding, mountain biking, surfing and climbing, the isometric contractions of your abductors and adductors stabilize your knees and pelvis. During horseback riding, your static adductor contraction communicates with your horse. Static strength training teaches you how to trigger abductor and adductor contractions at will. While this is a useful skill, isometric exercises are not effective as your only abductor/adductor strength-training workout. Don't trade in your gym membership for a Thigh Master, but do participate in Pilates classes that use the fitness circle, a flexible metal ring used for static strength exercises. The circles have pads on the outside and inside, which allow comfortable placement of your knees. If a fitness circle is not available, a stability ball or medicine ball will work for some exercises. When you plan an inner and outer thigh strength-training program, it's important to address their function as both stabilizers and mobilizers. Both muscle groups play a key role as stabilizers during squats and lunges. Certified trainer Eric Cressey suggests the sumo squat for inner thigh strength. This exercise, usually performed by huge wrestlers with tiny ponytails, involves a wide-stance squat with your legs turned out like a dancer. Other exercises such as the single-leg squat and the walking lunge also use your inner and outer thighs as stabilizers. When you get tired of waiting for the queen of the abductor/adductor machine to finish her 12 sets, grab a resistance band, find an empty room, wrap the band around your ankles and do side-stepping movements across the room in each direction. To target the inner thighs, perform the carioca. Not to be confused with karaoke, the carioca involves grapevine-type movements, with one leg crossing in front and behind the other. Slide boards are effective but expensive. Opt for one of those gliding disc type things. For a true "babes on a budget" alternative, wax your floor, place a towel under one foot and glide your leg toward and away from your body. This is multitasking at its finest. Is Pilates or Gyrotonics Better for Ballet?